In March 2006, Ron Moelis cut the ribbon on Northside Piers, one of Brooklyn’s largest-ever condominium projects, with a planned 1,000 units. It will be a long time before he has that experience again, he says. “You’re going to be very, very hard pressed to build a condo in this city for a number of years that has more than 100 units,” Mr. Moelis, the chairman and CEO of L+M Development Partners, said in an interview Friday. Manhattan condo projects are shrinking dramatically in size, as banks’ remain reluctant to finance huge buildings and developers have trouble finding suitable sites for large-scale construction. Some developers say the situation could drive them out of Manhattan to New Jersey, Long Island City and parts of Brooklyn. Others say they plan to juggle more Manhattan projects that are smaller. “When you do three or four of these jobs, as opposed to one or two big ones, I think in a lot of ways they’re easier to build. They’re doable,” said Mr. Moelis. According to data compiled by StreetEasy.com, new condo projects hitting the market in 2005 and 2006 had on average 83 units per building. That number has plummeted to 34 units this year. 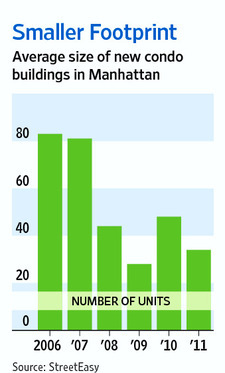 In both 2005 and 2006, 10 condo projects with more than 100 units in Manhattan came online. This year, there has been one, according to StreetEasy. Meanwhile, the boom in small condo projects has picked up. Mr. Moelis said he is now focusing on smaller, more innovative projects, such as PS 90, a 75-unit mixed-income condo project, and Columbia Hicks, a 42-unit condo and 94-unit rental project on the Brooklyn Waterfront. At least a dozen boutique projects in Manhattan and Brooklyn are now under construction or set to break ground in the coming months. At least six more are launching sales—from the Story House, an eight-unit condo in the Flatiron District, to 174 Jackson in Williamsburg, Brooklyn. The trend toward small projects is driven by financing, say developers. In recent months, cautious banks have started to give out small $25 million to $75 million loans. But few have been able to get the kind of $500 million-plus loans needed to move forward with megaprojects. For condo buyers that means a very different product. The brand-new 40th-floor bachelor pad with sweeping views of Central Park could become rare, as developers increasingly sell the pleasures of a project’s intimacy or exclusivity. “Buyers recognize the scarcity value of these projects,” said Joe McMillan, chief executive of DDG Partners, which received a $26 million construction loan for a brand-new roughly 40-unit condo building at 345 W. 14th St. near the Meatpacking District. It gained notoriety as a failed hotel project by rapper Jay-Z and hotelier Andre Balazs. Now it will be a condo project with imported Kolumba brick and a three-story bronze cornice. Smaller projects also lack amenities such as golf simulators and movie theaters that became common during the boom. But brokers say smaller projects pop up in neighborhoods such as SoHo or the West Village, which provide plenty of their own entertainment and services. 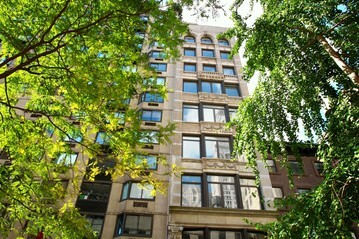 “At this location, in the heart of the West Village, you couldn’t build a big new development. This kind of real estate fits in with the fabric of the neighborhood,” said Margaret Streicker Porres, of Newcastle Realty Services LLC, who’s marketing a nine-unit renovation of historic 84 Bedford St. in the West Village, where units are priced from about $500,000 to $2 million. To be sure, a few mega projects are beginning to move forward. The Rudin family recently obtained a $525 million loan for a condo on the St. Vincent’s Hospital site in Greenwich Village. Extell Development Co. expects to close on a $700 million construction loan this month. The loans were hard to get even with prime locations and good credit. “It’s extremely difficult to finance large condos. Rentals you can get done, you can get small projects done,” said Extell president Gary Barnett. Developers said they don’t expect banks to ease lending for big condo project any time soon. In the meantime, rentals—a definite second choice during the last real-estate boom—could be the winners. At the Frank Gehry-designed 8 Spruce St., for example, Forest City Ratner Cos. made the building’s units all rentals, abandoning plans for condos on the top floor when the economy took a dip. The trend toward boutique condos is also driven by the lack of large areas for big developments. Toll Brothers Inc. is now working on several smaller projects in the city for that reason, said David Von Spreckelsen, a senior vice president at the company. “There are fewer and fewer sites and it’s harder to put together an assemblage, and you have to pay a lot of money,” he said.